Cakes & More: Jamie Oliver's Peach Clafoutis - Easy, Homey, Delish! Jamie Oliver's Peach Clafoutis - Easy, Homey, Delish! Its not everyday that you stumble upon a recipe which is super easy to make, does not have a load of fat, barely any flour, comes together in 10 minutes and bakes in 15. A simple yet satisfying homey kind of dessert you want to eat when you crave something sweet. Made with the most basic pantry staples, this clafoutis is something I could easily fall into the habit of making. On a busy week day or on a lazy weekend, this is one of the easiest desserts you could bake. A scoop of ice cream or some whipped cream will make this good enough for company too! Ever since I baked Tartine's Clafoutis, I have been trying more recipes of this French dessert. That was a slightly more substantial one, but delicious nonetheless! The custard lover that I am, clafoutis with lesser flour is a welcome addition to the dessert repertoire. I don't normally stock canned fruit, but now I think its not a bad idea to have a can or two to bake desserts like this on a whim. Store cupboard versions as Jamie calls them. Seasonal fruit like cherries, berries, plums or even apples should work good. I know you have heard this before I would anytime prefer eating fruit fresh to those cooked to any degree. But since fruit does add appeal to dessert, I like baking in ramekins as it reduces the baking time drastically. You could bake the clafoutis in a large oven proof dish, but then the fruit will be quite mushy. You could even skip the fruit and make a plain version, so what if we can't then call it a clafoutis? Pre heat oven to 220 C / 425 F.
Lightly butter 8-10 half cup /120 ml capacity ramekins. Cut the peach halves into 3 pieces each. Arrange two of these pieces in each of the ramekins. Place the ramekins in a large tray, spaced about an inch apart. Warm the milk so its barely warm (think you are warming milk to set yogurt in summer), this was 106 F on my thermometer. Err on the side of the milk being less warm than it being hot as the eggs may curdle. Whisk the warm milk gently into the egg mixture. 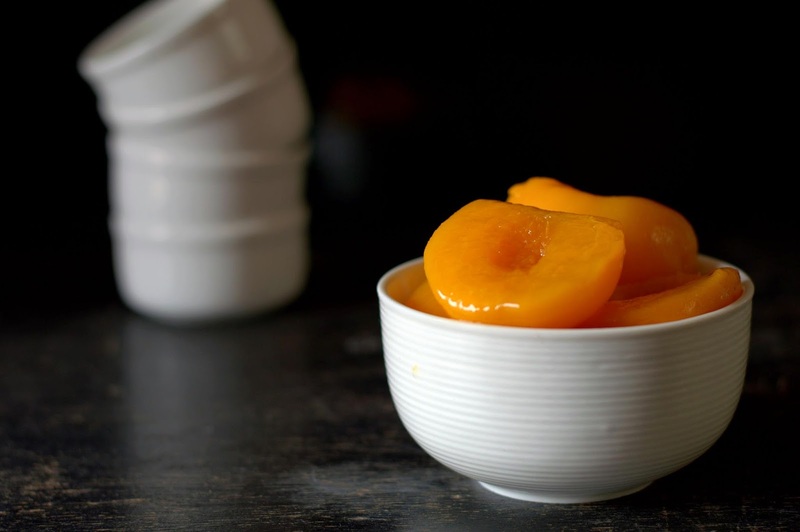 Pour it over the peaches in the ramekins. The ramekins will be 3/4 full. Bake about 13-15 minutes or till the custard is set but has a slight wobble when you shake it. To test, check at 13 minutes. Let the ramekins remain in the oven. 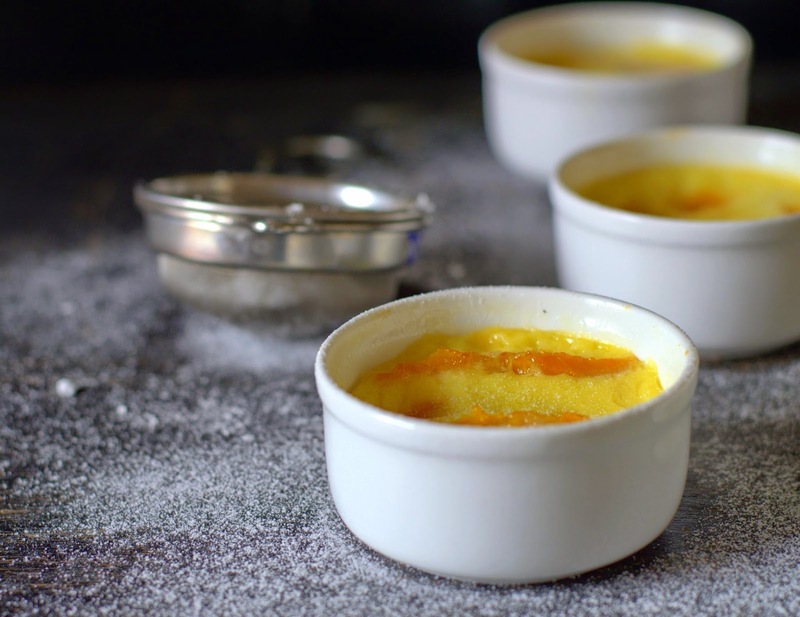 Shake one ramekin gently to see if looks set but has a slight wobble like jelly. If it looks runny, bake 2 minutes more. If in doubt, err on the side of under baking. The clafoutis will puff up a bit and then deflate. Remove the tray from the oven. Carefully transfer the ramekins on to a cooling rack. Let cool completely. Though this is eaten warm with a dusting of confectioner's sugar, I like clafoutis best at room temperature. Dust lightly with powdered sugar and serve with ice cream or cream. The original recipe uses 3 tablespoons sugar in the batter and 3 tablespoons dusted on top. I have used more and all in the batter. You could use lesser sugar if using more fruit as that would make the dessert sweeter. Jamie uses a 400 gram can (almost double). I have used less fruit as I like it to be more of custard. Do not use powdered sugar in the batter as it will clump. If baking the clafoutis without fruit, fill the ramekins 3/4 way up. Check at around 15 minutes. The baking time will vary depending on the size of the baking dish / ramekin. 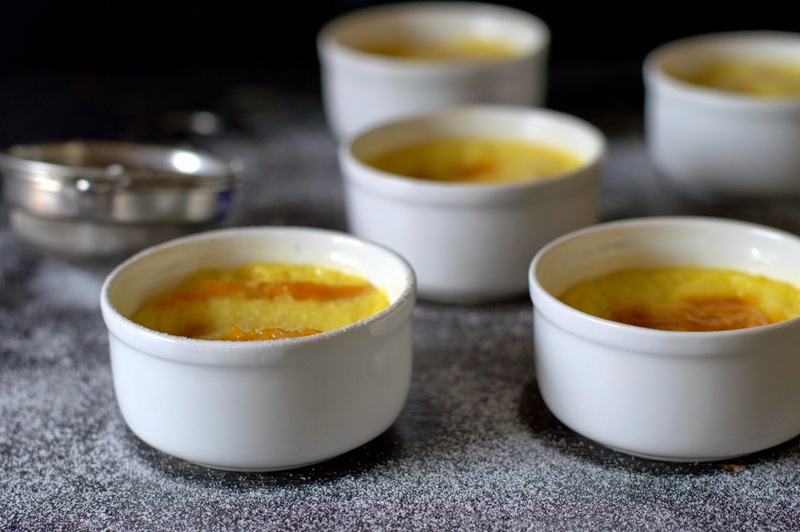 Even if you have never baked custard before, this should be easy enough to try. Very little effort, safe and good as long as you do not over bake. From inspiration to the table in 30 minutes, don't you think this is worth a try? This has been on my to do list for a long time. Thanks for a fool proof recipe. Bookmarking it. Love your blog, Suma!! The custard looks delicious! Just cant take my eyes from those alluring clafoutis..